The $402 million barrier wall project currently underway started in 2008. It was awarded by the USACE to Treviicos-Soletanche Joint Venture (TSJV), a Treviicos-led partnership between Boston-based Treviicos, the North American subsidiary of Trevi headquartered in Italy, and Soletanche Construction, a subsidiary of Soletanche-Bachy of France. It includes a multi-step plan that involves a preventative grouting program, construction of a protective concrete embankment wall (PCEW) and a new barrier wall within the PCEW. The new barrier wall is composed of a combination of three piling techniques to ensure a watertight barricade. The project improves upon the 1976 fix by installing a new wall 1,561 feet longer and as much as 70 feet deeper than the barrier put in place in 1976. Precision is critical, requiring advanced drilling equipment and methods for pile holes, pile excavation and pile placement. Joint-venture contractors began work by significantly augmenting the double-line grout curtains (installed previously by other contractors) in preparation for the barrier wall construction. TSJV’s low mobility grouting was designed to find and improve any soft contact areas at the interface of the earth embankment and the rock below. By implementing this additional soil stabilizing step, installation of the PCEW would be safer. TSJV drilled and grouted more than 760 holes – 180,000 linear feet of drilling – and injected 400,000 gallons of grout. The grouting program not only helped stabilize the area for the upcoming wall construction, but also provided additional data about the underlying karst limestone foundation. TSJV was able to combine this data with that of earlier projects to create three-dimensional drawings of the formation which were then used to design the installation sequence of the barrier wall in the most critical areas of the dam. Next came the construction of the PCEW, a concrete wall that was installed as a safety measure to stabilize the clay embankment from the effects of construction activity. It is within the PCEW that the complex piling system is placed to form the new barrier wall. The PCEW is a six-foot wide concrete wall ranging in depth from 115 feet to 235 feet and running the entire length of the barrier wall. It is 40 feet upstream from the barrier wall built in 1976. Crews built the wall in nine-foot long segments, using a Soletanche hydromill mounted on a Soilmec SC-120 crawler crane. The hydraulically powered hydromill used two counter-rotating heads to perform the excavation. A polymer-based slurry kept the excavation open. As the hydromill advanced downward, the excavated material was removed to a recycling plant and concrete was poured. The reliability of the Soilmec SC-120 has played a pivotal role in the project. Rated at 120 metric tons with a 13-foot boom extension, the crane offers features typically found on cranes designed to hoist heavy loads, while also serving as a multi-functional base for a number of specialized applications. The crane has also been used during special hoisting operations, as an attachment to hydraulic and mechanical buckets, and as a hydraulic rotary rig. Outfitted with a proportional hydraulic system, the rig features two hydraulic pumps with a flow rate of 125 gallons per minute. A Soilmec SC-90 crane, rigged with a clamshell mechanical bucket, was recruited to begin the excavation work, which allowed the construction of the PCEW hydromill panels to depths of up to 180 feet. Like the SC-120, the SC-90 also features a proportional hydraulic system with two pumps, each providing 107 gpm. As segments of the PCEW were completed, crews began drilling pilot holes down through the concrete in anticipation of the barrier wall’s secant piles. Directional drilling technology was used to ensure the best possible alignment of piles. The pilot hole approach also gave crews an opportunity to perform additional investigation of the foundation conditions. Four Soilmec PSM 16GTS rigs drilled the 1,255, eight-inch diametre pilot holes, which extended to a level five feet below the bottom of the PCEW. Alignment of each element was checked by four different methods: twice during pilot hole drilling (one in real time and one upon completion) and twice during pile excavation (again, one in real time and one upon completion). The final check used an ultrasonic drilling monitor designed to provide highly accurate data even in challenging soil conditions. The three initial sets of data were correlated with the ultrasonic reading, which then became the as-built drawings for each hole. These drawings were used to confirm that the proper alignment and overlap would be achieved when the full-size holes were drilled. A special 50-inch drill bit with a leading eight-inch nose follows the pilot hole and keeps the larger drilled piling on course. Ensuring continuity of the barrier wall was the project’s primary objective. To that end, contract requirements limit the barrier wall deviation from vertical to a maximum of 0.25 per cent with an overlap between elements of at least 0.5 feet. These requirements have been consistently exceeded along the project to the point that no remedial work was required due pile verticality issues. In addition, production rates using the pilot holes has been up to 30 per cent greater than original estimates. Crews have used three different construction methods to build the barrier wall: the combined barrier wall, secant pile wall, and Treviicos’ relatively new continuous secant pile system. Combined barrier wall panels were constructed for much of the easternmost 700 feet of the embankment. A reverse circulation drill was used to drill two 50-inch diametre piles on 126-inch centers. A nine-foot wide hydromill panel connected each pair of piles. While the combined barrier wall process was efficient and effective, shifts in job sequencing meant the secant pile wall system was used for the majority of the barrier wall. Here, 50-inch diametre piles were drilled on either 31.5-inch or 35-inch centres, starting with the pilot holes, through the PCEW and the rock underneath it. 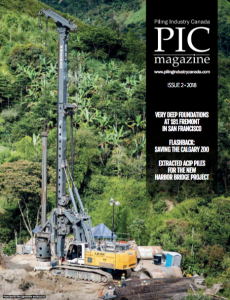 Two Soilmec drill rigs were dedicated to the predrilling operation, advancing the slightly oversized secant piles about 150 feet through the PCEW. Then, five reverse circulation drills drove the remaining 120 feet of the 50-foot diametre piles into the limestone rock. A third system – the secant pile system – was used on a limited section of the project. Developed by Treviicos for use on New Zealand’s Arapuni Dam project, it uses a smaller, shorter pipe-like piece attached to the drill to guide it, making the subsequent pile perfectly aligned with its predecessor. Once the first pilot hole and pile are drilled conventionally, the secant pile system can be used to drill three, four or more holes, producing one slot-like excavation ready for concrete. Soilmec’s Drill Mate System (DMS) monitors and controls all drilling operations on the secant pile system, set up to drill 50-inch diametre piles with a 40-inch axis dimension between the drill and the guide. This ensured physical continuity of the secant pile wall by the arrangement of its parts, and additionally cuts down some of the repetitive operations typically required in secant pile construction, such as setting up for each pile. It also minimizes the amount of excavated material by 25 per cent, which directly affects drilling time. While the continuous secant pile system was used on only a small portion of the Wolf Creek Dam barrier wall, it remains a promising approach for future similar projects. The condition of the dam’s foundation and the sheer number of tasks requiring coordination have made the entire project a challenge. Four areas totalling about 900 feet of the dam’s length were identified as “critical areas” because of the state of the underlying limestone. In fact, in a particularly cavernous section deemed “Critical Area 1,” work was halted for nine months early in the project timeline as a result of the USACE’s concern of embankment instability. In these critical areas, crews were limited in their use of equipment and methodology. Any drilling or excavation equipment had to be more than 90 feet apart to permit simultaneous excavation, compared to 40 feet in non-critical areas. Additionally, excavation of new elements closer than 40 feet to the edge of an already-concreted element could only proceed after the concrete had reached an unconfined compressive strength of 1,000 psi. In cases where the excavation was directly adjacent to a concrete element, the concrete strength had to have reached 2,000 psi. These multiple restrictions meant individually completed sections of the PCEW and barrier wall were completed in a leap frog fashion, then later stitched together to form an impenetrable barrier. The overall project schedule includes more than 13,000 activities. Despite the project’s complexity, its challenges and early delays in construction, the Wolf Creek Dam’s barrier wall was successfully completed on March 6, 2013 – almost eight months ahead of schedule. Thoughtful planning with particular emphasis on safety and quality contributed to the completion of the barrier with an outstanding safety record of more than two years and 1,300,000 man hours without a lost time injury. Barely any remedial work – less than 0.2 per cent – was required on the job. The quality of the work has been proven high through a unique verification coring campaign. During construction of the barrier wall, crews drilled vertical and inclined holes both inside single elements and in the joints between elements to confirm the wall’s actual permeability and concrete strength. The results obtained during this effort confirmed that the quality of the barrier reached outstanding levels, consistently exceeding the contract requirements and thus allowing the USACE to anticipate raising the lake level nearly a year earlier than expected. This translates into huge savings to the taxpayers by allowing the full utilization of the lake in terms of recreation and permitting the generation of electricity to return to full capacity.